RTD, which is suppose to be the region’s bus service, cuts that service, but wants to double its sales tax revenue to build more high-priced rail (Denver Post headline of August 18, “RTD staff calls for increased fares and service cuts”). Is there something wrong with this picture? So, the people that most need transit and the system that is the most accessible – namely the buses – will be cut, while the massively over-priced and underfinanced rail system can continue. Should we double RTD’s sales taxes in 2012? Although the lines haven’t been drawn and at least some maps leave him out of the 4th CD, Senate President Brandon Shaffer has already started a campaign against Republican incumbent Congressman Cory Gardner. Shaffer’s strategy is to label Gardner as extreme as former Congresswomen Marilyn Musgrave, defeated in the Democratic sweep of 2008. The latest Gallup national poll shows, using a generic ballot question, Democrats are seven points ahead in the election. A recent Democratic robo poll in Colorado shows Democrats up five points. Shaffer’s strategy is no doubt recommended by the Democratic Congressional Campaign Committee (DCCC), which encouraged him to run and targeted the district for a pick-up. And, of course, the new district boundaries will shape the race. But, Gardner is not Musgrave and 2012 is not 2008. President Obama is in the low forty percent approval, and is unlikely to be any help in Colorado. Gardner does have to be concerned if voters decide to toss all congressional pols out. Gallup reports that 70 percent of voters take that view in a generic question, although 54 percent say they would re-elect their own congressperson. The May sweeps show why Channel 9 gets about one-half of all the political advertising in metro Denver. Among the big three network stations in the very competitive (and very lucrative) 10:00 pm news hour, 9News has 47 percent of the viewers. Its partnership with the Denver Post on several hard and soft news items also adds to its clout. The two top candidates for mayor of Aurora have raised more than a million dollars. An open seat and Aurora remaining a friendly city for developers has attracted big money and some tough competition. Steve Hogan is ahead in the money race, but Ryan Frazier is running close. A recent poll has Frazier in the lead. Frazier’s advantage is name identification and partisanship. He was the Republican standard-bearer in a recent high-profile congressional race. Hogan is trying to be the establishment candidate (he has senior Tauer’s support) and has collected a substantial amount of developer money. Both Hogan and Frazier have had a hard time finding a serious political job. Who finally makes it? As pointed out in a previous blog, “‘Bright Colorado’ Faces Poor Prospect,” the proposed state sales and income tax increase for education – called Bright Colorado Initiative – has dim prospects. And, a new Democratic robo poll confirms that tax begins with more opposition than support. The collapse of the economy and growing anger with government makes a November tax increase even less likely. With it usual smart timing, the teachers union just endorsed the tax increase. While not a surprise, it’s clear they only reluctantly came to the table, and may still not spend much money. Recent polls show teachers union support is often a net negative in terms of its affect on the electorate. What is the education establishment’s motivation for endorsing a long-shot campaign? A Democratic-leaning robo Colorado poll gave President Barack Obama just 46 percent approval during the first week of August. It claims independents lean against him 38 percent to 56 percent. A Gallup poll of Obama’s first six month had his Colorado approval at 44 percent on average. His current national approval has been sinking since the credit ceiling debacle, and is now down to about 40 percent. His disapproval is consistently higher than approval. A national Democratic robo polling firm reports Governor John Hickenlooper has a 54 percent approval rating with Colorado voters. They speculated that since he had the third highest approval among the Democratic governors they tested, he is a potential presidential candidate in 2016 – a little premature. 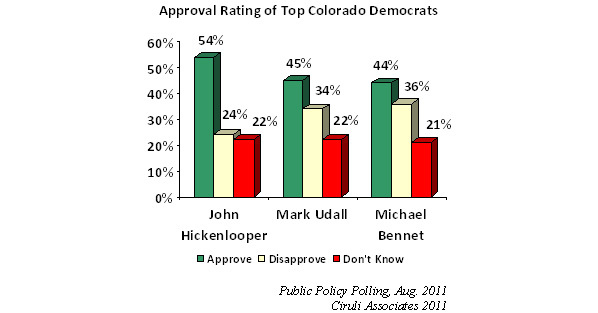 Neither Senators Michael Bennet nor Mark Udall broke 50 percent approval. Hickenlooper’s distinguishing characteristic is his stronger support among Republicans (34% approval) due to some conservative positions, such as budget cutting and his non-partisan image. A couple of points. Fifty-four percent support is not high for a Colorado governor. Roy Romer and Bill Owens often had approval ratings in the high fifties. But, of course, those were times when we were less polarized and angry with politicians. In fact, Hickenlooper during his term as Denver mayor regularly had an approval and favorability rating in the 70-percent range, both in Denver and in the metro region. This poll leaned eight points Democratic, more than registration or the November 2010 electorate (PPP poll – 41% Democrat, 33% Republican; registration – there is a 102,000 Republican active voter registration advantage; 2010 exit poll – 33% Democrat, 28% Republican). In a series of local Colorado polls conducted in May through July 2011, the public was concerned about the economy and only weakly supportive of new taxes. Tax extensions were the only revenue measures that appeared to have support. Unfortunately, the real economy, the public’s confidence in the economic direction and the public’s view of government has darkened since the debt ceiling debate. Sales tax revenue is declining in many Colorado jurisdictions from previous rates. Also, new national polls show a severe hopelessness about the government’s ability to fix the problem. This new political environment, if it continues, could negatively affect November tax initiatives. Colorado’s presidential caucus will be on March 6, the 2012 date for Super Tuesday. Nine states will hold their caucus or primary March 6. That is one month later than the 2008 Colorado caucus when Barack Obama and Mitt Romney both won their respective party caucuses handily in record turnout. The Democratic caucus will be a sleeper, but the Republicans are likely to still be in a fierce battle. Many states are still considering moves on the calendar, including into December. But, as of today, the 2012 presidential nomination schedule will begin February 6 with the Iowa caucus. During the first six months of 2011, President Barack Obama averaged 44 percent approval in Colorado, with 48 percent of residents disapproving. His national average was 47 percent approval. 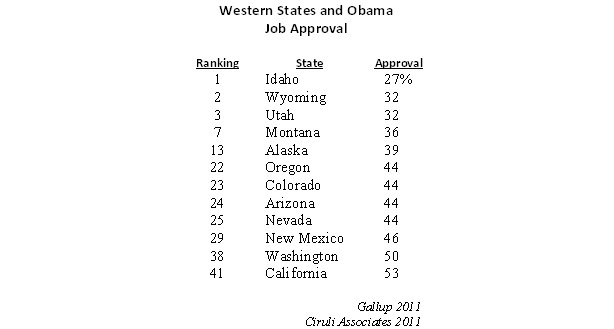 Mountain western states tended to be on the low end of the approval scale, along with many southern and midwestern states. Colorado, with neighboring states New Mexico, Nevada and Arizona, are in the center range of presidential approval, but below 50 percent – a problem for Obama’s re-election. See Gallup poll: Obama job approval 50% or higher in 16 states and D.C.
America’s government institutions and the political establishment that operates them are in a crisis of legitimacy. The left believes the system is immoral due to its failure to promote its vision of redistributive social justice. The right believes the system is abandoning the Constitution and strangling liberty. And, the average citizen believes the American political system simply doesn’t work. It no longer provides prosperity and, more importantly, younger people are losing hope for a better future for themselves and their children, and among baby boomers a secure retirement is. The debt ceiling crisis may have been the breaking point in public trust in the system. Poll after poll shows the public has lost patience with Washington. • The country is on the wrong track. • Major institutions, Congress, the presidency and parties hold little public confidence. • Public confidence in the recovery and the economy is dropping. Democracy is still valued, but losing support as it is now operating – partisanship, polarization, gridlock. • Conflicts, such as over the debt ceiling, are interpreted as failures of the system and the results not supported by any faction. When a system in crisis is about to renew its political mandate in a general election, expect volatile politics, colorful characters and extreme positions. 2012 should be unpredictable and probably scary. • Berlusconi is the youngest looking old leader in Europe. • Italy’s government, even under an embalmed leader and weak party, appears more capable of action than the U.S.
• Mostly Italy’s current financial run is based on speculation and not fundamentals. Hence, political action combined with public relations is as important as anything the EU does. And, frankly, no one believes the EU has the will or money to help Italy if it really begins to fall apart. Public schools that have long held significant support as a fundamental American institution are losing public confidence. The latest Gallup poll records near record lows in public confidence in schools. In an annual poll, Gallup reports confidence in institutions and counts “a great deal” and “quite a lot” as a metric for the level of confidence in an institution. Historically, uniform and universal public education was seen as essential for spreading literacy and for the functioning of the economy and democracy. But the crisis of public education reported since the mid-1980s has undermined those perceptions for many Americans. · Big city school districts have received a steady stream of criticism for decades, but due to statewide testing programs, now even more respected suburban school districts appear poorly performing with low scores and high dropout rates. · The teachers union’s visible effort to thwart reform and choice in public education has turned off many urban liberal and moderate members of the attentive public. Their aggressive efforts to protect work rules, salary increases and pensions in the recession have separated them from the non-unionized and private sector citizens that historically viewed teachers sympathetically and as a class of respected professionals. · The public school system in general, as one of the most revenue consuming government sectors, has become a target for reduction and reform in the recession. Many elements of the public school establishment continue to believe that since education is essential for America’s economy, so are public schools. That connection has declined and that decline will likely continue. Public schools must increasingly compete with choice alternatives, both public and private, that are gaining credibility with public education’s historic constituents, especially urban liberals and the African-American community. 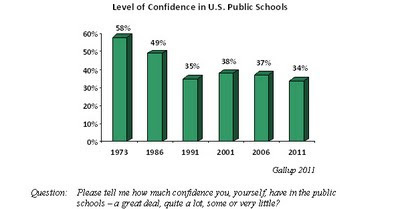 · When examining the levels of confidence among major subgroups of Americans, public education is now doing poorly with its main customers, namely people aged 30 to 49 who more likely have children in the system than older citizens, college graduates who most likely came out of public schools and value education, and independent voters necessary to maintain voter majorities needed to win local school board and bond elections and fights in legislatures. Finally, confidence is lowest in the West, which is dominated by residents of California, the bastion of Democratic and liberal power in the country. The political crisis of public education is now visible around the country and in Colorado. The federal government, along with many big city mayors, is a strong advocate of choice and reducing the unions’ monopoly control. In Colorado, recent battles over public school legislation opposed by the teachers union saw the Democratic Party divided and the anti-union position victorious. Also, the 2010 U.S. Senate Democratic primary pitted pro- and anti-union forces with a former reform superintendent being the winner. The recent Denver mayor’s race saw the pro-reform, non-union endorsed Democrat win over a Democrat more closely aligned with the teachers union. The election of November 2010, which swept the most liberal House of Representatives, since the modern use of the term, out of power, brought in the most conservative – more conservative than the Gingrich’ House of 1994. The debt ceiling crisis gave the House, and especially its Tea Party Movement minority, leverage to change the direction of the country’s fiscal policy. And, they used it. The debt ceiling legislation puts the country on a different fiscal course of budget cutting and spending reduction. But, it also shifts the politics of the debate toward austerity. Liberal Democrats are playing defense. Their main strategy will be a class warfare argument of the need to tax the rich to add more revenue to save the government domestic entitlement programs put in place over decades and greatly expanded with the health care reform legislation. During the August recess, they will, of course, complain about the congressional process. It’s irresponsible, too partisan, etc. And, they will endorse various aspects of budget cutting that appear to have little immediate effect, such as the balanced budget amendment. But, the issue will not go away. The existence of various mechanisms in the debt ceiling legislation will place the issue front and center before the end of the year. And, of course, the 2012 election will be largely framed by the debate. The most successful candidates will keep a focus on fiscal restraint while figuring out a strategy to invigorate the economy, improve the jobs picture and increase consumer confidence. Success in that balancing act will ultimately decide if Republicans sweep in 2012 or Democrats hold the line. Channel 9’s debt ceiling coverage predicted passage of the compromise, even if not popular with Congress, because the political cost of not doing so was too high. The coverage also described the political meaning of the debate and its longer term political consequences. Washington political polarization added weeks to the debt limit negotiations, and after the leadership of both parties and the branches of government finally found a compromise, the powerful wings of each party complained and made final approval a drama. But Washington’s polarization just reflects the nation’s. The latest Gallup poll shows that the percentage of voters who have called themselves moderate has declined from 40 percent early in the century to 36 percent now, while the big winner has been conservatives, who have moved from the mid-30s to 41 percent today. Liberals have also moved up in support, but remain locked in the low 20 percent level, even after an articulate liberal president and liberal Democratic control of both houses of the legislature for much of the last three years. Hence, voters are twice as likely to describe themselves conservative than liberal, which largely explains why the Democrats, even with control of the presidency and U.S. Senate, could not dictate the terms of the debt ceiling deal – the public is much more comfortable in the camp of budget cutters than tax raisers. Senator Rollie Heath, the grandfather of Colorado liberals, the patron of lost causes, has a new one – raising state taxes in November 2011. Heath’s last foray into hapless campaigns was to challenge Bill Owens in his 2002 re-election. Heath got 35 percent, or the core vote of partisan Democrats and liberal independents, the same groups that will likely give him their vote this year. Although Heath unconvincingly claims he expects to win, in fact, his apparent main motivation is to get a conversation going about the well-recognized structure shortfall in state revenue compared to state expenditures. To the extent Heath wants a statewide dialogue on long-term revenue shortfall, he has some advantages, but ultimately we have had these discussions before with even more articulate advocates, such as former House Speaker Andrew Romanoff, with no long-term effect. Romanoff spoke clearly to the state’s financial challenge in 2008 supporting a ballot issue to modify TABOR and fund education – the same year Bill Ritter, then governor, advocated for a severance tax charge to fund higher education. Both items were defeated and the conversation stopped. Heath will likely make ballot gathering more than 100,000 signatures, which goes to his advantage this year. The government class is in panic. The third of the economy that works for various levels of government or receives pensions realize their income is in danger. They are prepared to work and vote to hang onto their positions. The case for a structural default is well made. Numerous studies have been conducted by reputable sources that some choices must be made and there is a broad consensus, including among much of the business community, that more revenue is needed. So, Heath has a core group to help petition and a general stock of studies to draw arguments from. But, he is handicapped, most likely fatally by the fact that a substantial bloc of potential supporters do not believe this is the moment to go to the ballot. Governor Hickenlooper specifically pronounced no tax increases in the short-term as part of his effort to position himself more in the center of the electorate. There is also a body of opinion that this moment in recovery is not the time to raise government revenue and reduce consumer and investment revenue (sales and income tax increases). Nationally, of course, the argument has shifted to less spending, no new taxes and reduced debt. It is likely the Colorado Republican Party will be united against new taxes. And what scares many Democrats hoping to hold control of the State Senate and regain the State House is being labeled pro tax and pro more government. Heath will receive a polite reception, but little help. But, as the last three polls above describe, Obama may be winning the immediate battle over the debt ceiling, but he appears to be losing the war. Americans are becoming increasingly anxious about the economy and annoyed with Washington. Presidential re-elections are largely retrospective, with the state of the economy the most important criteria. Obama developed the image of being cool and unflappable, but in the present crisis, he appears passive and unengaged. Although he threw himself into the debt ceiling struggle, he was not able to dominate it and had to share the effort to frame it. Ultimately, Obama’s re-election will be a choice, but today, it remains mostly a referendum, which Obama loses by at least the margin of error.